Keeping students involved, motivated, and actively learning is challenging educators across the country,yet good advice on how to accomplish this has not been readily available. 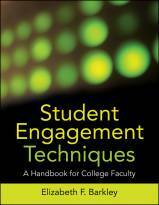 Student Engagement Techniques is a comprehensive resource that offers college teachers a dynamic model for engaging students and includes over one hundred tips, strategies, and techniques that have been proven to help teachers from a wide variety of disciplines and institutions motivate and connect with their students. The ready-to-use format shows how to apply each of the book's techniques in the classroom and includes purpose, preparation, procedures, examples, online implementation, variations and extensions, observations and advice, and key resources. "Given the current and welcome surge of interest in improving student learning and success, this guide is a timely and important tool, sharply focused on practical strategies that can really matter." "This book is a 'must' for every new faculty orientation program; it not only emphasizes the importance of concentrating on what students learn but provides clear steps to prepare and execute an engagement technique. Faculty looking for ideas to heighten student engagement in their courses will find usefultechniques that can be adopted, adapted, extended, or modified." "Elizabeth Barkley's encyclopedia of active learning techniques (here called SETs) combines both a solid discussion of the research on learning that supports the concept of engagement and real-life examples of these approaches to teaching in action." Elizabeth F. Barkley is professor of music at Foothill College in Los Altos, California. She is a nationally known scholar, educator, and consultant and has been the recipient of several honors, including being named California's Higher Education Professor of the Year by The Carnegie Foundation for the Advancement of Teaching. She is coauthor of Collaborative Learning Techniques from Jossey-Bass. Part One: A Conceptual Framework for Understanding Student Engagement. 1 What Does Student Engagement Mean? 2 Student Engagement and Motivation. 3 Student Engagement and Active Learning. 4 Promoting Synergy Between Engagement and Active Learning. 5 Additional Facets to Consider. 6 From Theory to Practice: Teachers Talk About Student Engagement. Part Two: Tips and Strategies. 7 Tips and Strategies for Fostering Motivation. T/S 2 Develop and display the qualities of engaging teachers. T/S 3 Use behaviorist-based strategies to reward learning rather than behavior. T/S 4 Use praise and criticism effectively. T/S 5 Attend to students' basic needs so that they can focus on the higher-level needs required for learning. T/S 6 Promote student autonomy. T/S 7 Teach things worth learning. T/S 8 Integrate goals, activities, and assessment. T/S 9 Craft engaging learning tasks. T/S 10 Incorporate competition appropriately. T/S 11 Expect students to succeed. T/S 12 Help students expect to succeed. T/S 13 Try to rebuild the confidence of discouraged and disengaged students. 8 Tips and Strategies for Promoting Active Learning. T/S 14 Be clear on your learning goals. T/S 15 Clarify your role. T/S 16 Orient students to their new roles. T/S 17 Help students develop learning strategies. T/S 18 Activate prior learning. T/S 19 Teach in ways that promote effective transfer. T/S 20 Teach for retention. T/S 21 Limit and chunk information. T/S 22 Provide opportunities for guided practice and rehearsal. T/S 23 Organize lectures in ways that promote active learning. T/S 24 Use reverse or inverted classroom organization. T/S 25 Use rubrics to give learners frequent and useful feedback. 9 Tips and Strategies for Building Community. T/S 26 Move away from an authoritarian role. T/S 27 Promote class civility. T/S 28 Create a physical or online course environment that supports community. T/S 29 Reduce anonymity: Learn students' names and help students learn each other’s names. T/S 30 Use icebreakers to warm up the class. T/S 31 Use technology to extend or reinforce community. T/S 32 Be consciously inclusive. T/S 33 Subdivide large classes into smaller groupings. T/S 34 Involve all students in discussion. T/S 35 Use group work effectively. T/S 36 Revisit icebreaker kinds of activities later in the term. 10 Tips and Strategies for Ensuring Students Are Appropriately Challenged. T/S 38 Assess students' starting points. T/S 39 Monitor class pacing. T/S 40 Help students learn to self-assess. T/S 41 Differentiate course elements to meet individual student needs. T/S 42 Use scaffolding to provide assistance for complex learning. 11 Tips and Strategies for Teaching for Holistic Learning. T/S 43 Pick up the pace to hold attention. T/S 44 Offer options for non-linear learning. T/S 45 Use principles of universal design. T/S 47 Teach so that students use multiple processing modes. T/S 48 Incorporate multiple domains when identifying learning goals. T/S 49 Include learning activities that involve physical movement. T/S 50 Consider creating a “graphic syllabus”. Part Three: Student Engagement Techniques (SETs). Category I. Techniques to Engage Students in Learning Course-Related Knowledge and Skills. 12 Knowledge, Skills, Recall, and Understanding. SET 1 Background Knowledge Probe. SET 3 Focused Reading Notes. 13 Analysis and Critical Thinking. SET 10 Believing and Doubting. SET 15 Small Group Tutorials. 14 Synthesis and Creative Thinking. SET 16 Team Concept Maps. SET 23 What's the Problem? SET 25 Think-Aloud-Pair-Problem Solving (TAPPS). SET 29 Contemporary Issues Journals. SET 30 Hearing the Subject. Category II. Techniques for Developing Learner Attitudes, Values, and Self-Awareness. SET 40 Stand Where You Stand. SET 42 Critical Incident Questionnaire (CIQ). SET 43 Go for the Goal. 19 Learning and Study Skills. SET 46 Resource Scavenger Hunt. Appendix A: Key to Courses and Professors in SET Examples. Appendix B: NSSE/SET Crosswalk Tables.